Today's feature is a guest post by my partner-in-crime, Cristina Hall. She is a marketing consultant and holistic health coach-in-training. She writes about health, cooking, and wellness on her blog, La Solutionista. As a native of Atlanta, there are a lot of things that I miss about the city while I am away – buying fresh Georgia peaches from a local farmer, shopping at Trader Joe’s, The Wright Gourmet’s Signature Mustard Sauce, drinking SweetWater 420 on draught at Dagwood’s (my all-time favorite pizza place), and of course, my wonderful girlfriends. At the recommendation of a friend who used to work there, I recently visited the Brick Store Pub with three girlfriends for drinks and dinner. Now, I will also miss the amazing beer selection and atmosphere at this relaxed but lively restaurant in Decatur, GA. Skimming their website beforehand, I was excited to learn that the pub was celebrating its 15th Anniversary with a week-long celebration. That evening they were featuring sour beers, a style recently introduced to me by a friend in Charleston. It had been a long time since I'd stepped into a restaurant in the states on a Wednesday night and encountered a 30-45 minute wait. With its exposed brick walls, wrought-iron chandeliers, and open, spacious dining room, it is not hard to see why so many of the patrons appeared to be regulars. I am a notoriously slow decision-maker when it comes to ordering food and beer, so I just asked the bartender what sours they had on draught. He smiled and brought me back a sample to try. His selection tasted familiar, and I was happy to learn that he had picked out a beer from the New Belgium Lips of Faith Series. It was the Tart Lychee, a sour that I had tried and loved when we were in Nashville and had been looking out for the last few weeks with no success. What I like about this beer is that it combines my favorite flavors from beer and white wine in the same glass. It's a very approachable beer for people who have not tried sours before. I asked our waiter for a second sour recommendation and he brought out one of their Belgian selections – Petrus Aged Ale, much more dry and tart than the Tart Lychee. Good beers in hand, the girls and I started eyeing the food selections. We started off with a cheese plate including Fortsonia, a local raw cow cheese from Georgia, and two goat cheeses from Spain: Monte Enebro and Aldeon. The plate was served with a strawberry balsamic glaze and a blueberry bourbon sauce. The cheeses did not last very long. As a pescatarian, I was happy to find some healthy vegetarian options on the menu including the Sweet Potato Curr “ey” that I ordered as my entrée, and both the Arugula and Field Greens Salads that the four of us shared as starters. Two of my girlfriends got one of the specials, which was 15-year Red Breast Whiskey-Braised Beef, with heirloom tomatoes and served with colcannon and candied carrots. They were each very pleased with their selection. The menu also had a nice selection of more traditional pub-style items such as Fish and Chips and Cast-iron Pot Pie, as well as a nice variety of sandwiches and appetizers. After dinner we went upstairs to explore the Belgian Bar, but were briefly distracted by the famous Cellar Room. I stared longingly into the cellar (so much good beer!) but will have to save that for my next visit. 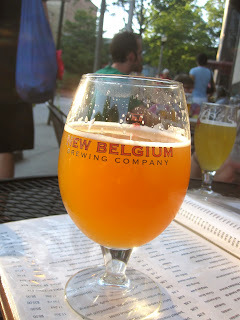 The Belgian Bar upstairs was opened in 2004 after the beer laws in Georgia changed to allow for the sale of beer over 6% ABV. Once serving solely Belgian beers, the upstairs bar now features beers from around the world. The wooden walls, low ceilings, and dim lighting reminded me of traveling through Europe and when I first fell in love with good beer. Cristina with Brick Store Pub co-owner Mike Gallagher. Upstairs I was able to briefly catch up with one of the owners, Mike Gallagher, who was celebrating with a huge bottle of Belgain Van Dieu, a sweet, dark beer with notes of raisin. The beer reminded me of Dogfish Head’s Raison D’Etre, and tasted especially sweet after all the sours I had been drinking. When the pub was started back in 1997, Brick Store Pub was only offering about fourteen beers. Now, Mike says that “it is a wonderful time to be in the beer industry” and that there is an endless supply of interesting beers available. He said that he was pleasantly surprised by how many people came out for the sours. It just goes to show that people are looking to support local, innovative businesses like the Brick Store Pub that offer their clientele exactly what they are looking for – new and interesting beers to try and a great atmosphere to catch up with old friends. The Upstairs Belgian Bar opens at 5pm Monday - Thursday, 12pm Friday - Sunday. The Belgian Bar at the Brick Store Pub.